Shabbat Shalom! Earlier this week, when I prepared the words of Torah that I am about to share with you, I had no idea that I will need to preface them with a sad dedication. As you all know, on Shabbat, we are prohibited from delivering eulogies. But I would like to nevertheless dedicate this drasha and the learning we are about to embark on together to the memory of a very dear friend who left us just a few days ago, Mr. Bernat Moldovan z”l. May his memory continue to be an inspiration and a blessing to all those who knew him, and may his soul be forever bound in the Bond of Eternal Life! A couple weeks ago, as Quebec was celebrating Fête Nationale, many miles away, in the heart of the Arabian Peninsula, a historic event was taking place. A peculiar ban was finally lifted. For the very first time ever, women in Saudi Arabia were saved the obligation to hire a man to drive them wherever they needed to go, and were instead allowed to get behind the wheel of a car and drive themselves there. ”This is surreal. Am I really driving in my own country? I feel happy, relieved. I feel like I’m free”, said Mona Al-Fares, a doctor, who got in her car even before midnight on June 24, waiting for the decades-long ban to lift. “It’s a remarkable historical moment and I wish the entire world would be here to witness it”, said another woman, Baheirah Khusheim, age 33, who drove her car that night on the very same route she had illegally taken alongside her late father 15 years prior, at that time disguised in her brother’s clothing to avoid being arrested. Historic indeed. Women took selfies and celebrated publicly. The press was cheering. The civil rights groups were ecstatic. Voices of support and encouragement were heard everywhere. To be sure, there were also plenty of sceptics, as well as people who pointed out that the lifting of the driving ban was really just a drop in an ocean of inequality, discrimination and human rights violations that still exist in that part of the world, an ocean too vast to cross and too deep to swim in. And, surely, “the entire world” would likely not take Baheirah up on her offer to join her in Saudi Arabia in celebration. In any case, one thing is clear: Saudi Arabia is but one place in the world where gender inequality still exists today – maybe one of the worst, but certainly not the only one. We are far from an ideal society, that’s for sure. Yes, we know, Canada’s cabinet is nowadays gender equal, “because it’s 2015” as our Prime-Minister pointed out a while back, but the process is still slow and difficult. And when we look at the scale of history, the picture is even grimmer. It is true that in the past century or so women’s rights everywhere took a turn for the better. But that turn is pretty much just that: a purely modern phenomenon. 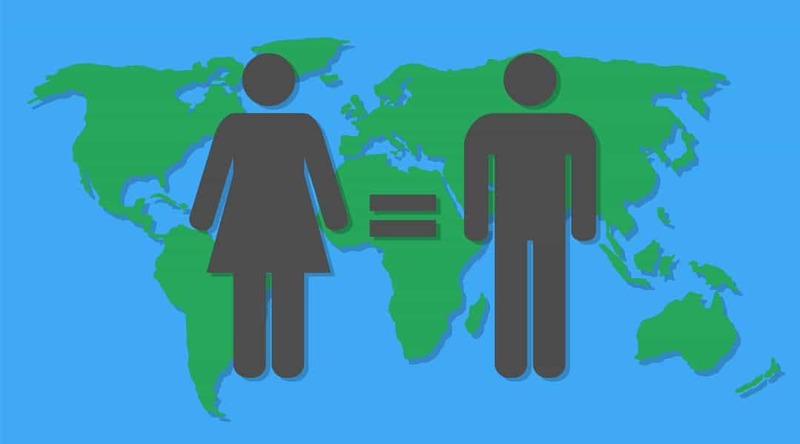 For most of the world’s recorded history, a great disparity existed between men and women, and their respective rights in society. In fact, in the last hundred years, women’s rights have increased more than in the previous three thousand years combined. Women’s right to vote, to be elected, to own property, to work, to choose a spouse, to divorce, to relocate, to be free of domestic violence – and the list could go on – all these are relatively modern inventions. The United Kingdom started allowing women to vote in 1869. The United States in the 1880s. Canada in 1921. France in 1945. Many countries in South America and Africa as late as the 1960s or even the 1980s. And Saudi Arabia (again) only in… believe it or not… 2015! For thousands of years, women’s rights were very basic, if any. Also, women had primarily a domestic role, being relegated to the home and the family, while men dealt with politics, war, economy, finances and pretty much everything else in society. Now, it’s easy (and fairly tempting) to criticize history. It’s easy to look through modern lenses and to deplore past societies’ lack of… well, modern values. But that is exactly the key: modernity. Criticizing the past is often an exercise doomed to fail, because societies must be judged primarily by the standards of their own time, and not by standards that might potentially emerge in the future. But there is one notable exception even by historical norms: Judaism. Analysed through modern or Biblical lenses, Judaism is a very progressive religion, well beyond its time. The Torah and Talmud contain many examples to prove this. In societies where children had no rights, women had no rights, slaves had no rights, strangers had no rights etc. – the Torah and the Rabbis created rights for all people. The categories above were not only mentioned en passant, but explicitly listed. Do not oppress the stranger. Protect the widow and the orphan. Allow your slave to rest on Shabbat. Respect the property of others. Value family life. Take care of your spouse and children. Don’t take advantage of others. Don’t hit your fellow man. Don’t cheat. Don’t steal. Do not be cruel. Life is sacred. Human dignity is paramount. Every man or woman is created in the image of G-d, and because of that we are all worthy of respect and appreciation. Let’s learn about this together! At first glance, the women’s request is simple: give us our father’s inheritance. But that is not the only message here, as we are about to discover. Let’s begin with a surprising idea. A modern commentator, Rabbi Gil Student, founder and editor-in-chief of Torah Musings, points out that this paragraph might actually be not even be about women’s rights. The daughters talk about their father and then use the phrase למה יגרע – literally “Why should he lose out?”, “Why should his name be omitted?” So the paragraph might not be so much about women’s rights, but rather about the rights of certain men with a particular family situation. Nevertheless — directly or indirectly — the daughters do get the inheritance, which is a novelty for the standards of the time. The second idea comes from the particular phrase used by Zelophehad’s daughters, a phrase which actually appears in the Torah in one other episode. In Numbers chapter 9, Jews who were unable to offer the Pesach sacrifice through no fault of their own ask the same question of Moses: למה נגרע (“Why should we lose out?”). To which G-d replies by instituting Pesach Sheini, the Second Passover, a chance to make up for the lost opportunity. Perhaps here as well we are dealing with a request for a second chance, the chance to engage in exercising the rights and responsibilities of a landowner. Tightly linked to this idea is the fact that we are not talking here about just any random piece of land. It is a piece of land in Israel. Many mitzvot are connected to the very status of owning land in Israel: terumah, maserot, leket, peah, bikkurim, some of the stringencies of orlah etc. And Zelophehad’s daughters were deeply in love with the land of Israel. This much is clear if we read Rashi’s commentary, where he points out that the Torah gives us a full genealogy for these women: “daughters of Zelophehad, son of Hepher son of Gilead son of Machir son of Manasseh son of Joseph”. Now, up until Manasseh, it may be a necessary genealogy, because after all the land of Israel was meant to be divided among the tribes, and Manasseh was indeed one of those tribes. But why mention Joseph here? Rashi explains: “to show that the daughters held the land precious”. Just as Joseph specifically asked to be exhumed from Egypt and brought to Israel, because he loved the land so much, so too the daughters of Zelophehad love the land of Israel, and don’t want to forgo their share in it. According to this interpretation, their request comes thus not from a place of greed or family pride or desire for monetary gain, but rather from a place of deep love and appreciation for G-d’s gift to the Jewish nation. Lessons can be derived petition recipients as well. Many leaders today are offended when they receive requests for rights or complaints of inequality. They feel threatened. Their self-confidence takes a hit. They start to deflect. Do you mean to say that my leadership was lacking so far? Are you accusing me of something? The Torah’s answer to these passive-aggressive questions is simple: no, it does not imply that. It just implies that no person can be perfect. We are all subject to improvement. We can all do better. Life is not static. Values evolve. People want things to constantly improve. And when requests for improvement are raised, they should be analysed on their own merit and with an open mind, and not a priori dismissed out of fear, guilt or offense. What is being clarified here is the very nature of equality. Equal means equal. If in religious matters, such as yibbum (the levirate marriage that was practiced in the case of a man who died without offspring), daughters are taken into account to relieve that obligation, then they also should be taken into account in civil matters too, for example in the case of inheritance. Civil law and religious law should be consistent, not divergent. These are truly remarkable and revolutionary ideas, especially for their time. Equality is universal and G-d’s will. It should not be left at the whim of the leaders or the times. Equal rights come with equal responsibilities. Requests for rights should be made at the proper time and in the proper manner. They should stem from love and commitment, not greed or rebelliousness. And they should be treated fairly, on their own merit, when they are brought about. Religious values should be synced with civil values, complementing each other for the benefit of society and its members. I am absolutely sure that – were we to continue – many other ideas would emerge from these verses. But to me, the most fascinating idea is that the Torah talks so openly about equality, rights, responsibilities and opportunities. As a religious text, we would perhaps expect the opposite: excessive rigidity, catering to the elites, staying stuck in the underpinnings of its time. But the Torah does not do any of that, and far from it. It is modern, alive and life-changing. Now, I don’t know if the lifting of the driving ban in Saudi Arabia will create history in the long run. I don’t know if it will be an inspiration or a turning point in the lives of people living there, in the life of the civil rights groups, the women’s right movement or any other type of group or movement there or elsewhere. What I do know for sure is that, lehavdil, the text we are studying every day, every week and every year, the one which sits at the base of so many of our modern values and norms, the Torah, is indeed historic and inspirational. We are here today, at this moment in humanity’s timeline, because of requests such as the one issued by the daughters of Zelophehad, and because of answers such as the one given by Moses and G-d. Innovation, societal values, rights and responsibilities are not created in a vacuum. They are echoes of what once was, of how change emerged, of how G-d wanted the world to be, and how the people called to the task understood and implemented His will. Whether a precursor of modern-day feminism, or a universal humanistic call for equality, the appeal of the daughters of Zelophehad continues to inspire and to instruct. If only today’s leaders, organizations and nations would heed its lessons and take up its call!